South Korea's trade surplus with the United States fell sharply to below the $20 billion mark last year for the first time in six years, U.S. data showed Saturday. The world's largest economy posted a deficit of $17.9 billion in trade with South Korea in 2018, down from a deficit of $23.1 billion a year earlier, according to the data released by the U.S. Census Bureau. It is the first time that the numbers have fallen this low since 2012, when the U.S. reported a $16.6 billion trade deficit with Asia's fourth largest economy. Citing massive the goods trade surplus with the U.S., Washington has kept South Korea on its monitoring list of currency manipulating countries, along with China and Japan, since 2017. 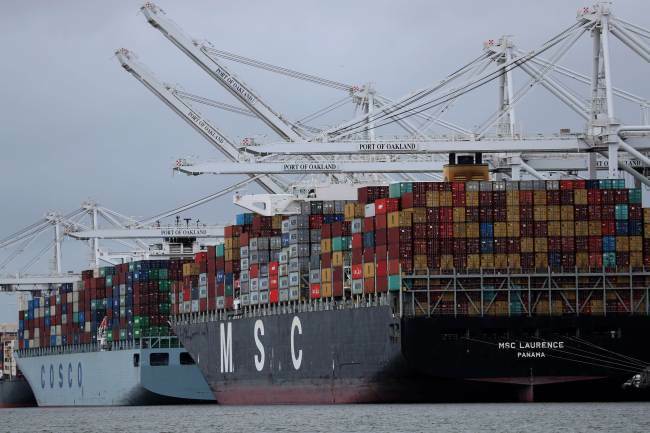 The U.S. has three criteria for judging whether its trade partners are currency manipulators -- trade surplus, current account surplus and market intervention. A country with a surplus exceeding $20 billion meets one of Washington's three criteria. The U.S. Census Bureau said South Korea's trade surplus had remained above $20 billion for five years since 2013, with a record surplus of $28.3 billion being tallied in 2015. The decline mirrors the Northeast Asian country's greatly increased imports of U.S. energy resources in recent years. Based on separate data provided by the Korea Customs Service (KCS), South Korea imported $11.2 billion worth of U.S. fuel, including shale gas, in 2018, compared with a purchase of $1.7 billion in 2015.